In Preston County, the Streets name is synonymous with business. A quick google search will present the terms General, Grocer/Wholesale, Home Furnishings and Retail, but Prestonians use a few different adjectives. Hard working, reliable, trustworthy and quality are words that come to mind. Need building supplies? Go to Streets. Need groceries or furniture, go to Streets. 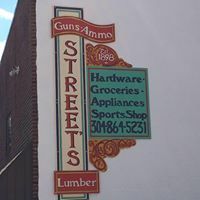 Need guns or ammo?? You get the picture. Streets really is our everything store. They’ve been in business for over 100 years and we are proud to award the Longevity Award to Streets Store and the Streets family.